One way to my heart is through gifts. I love me some gifts! Throw some lavender scent in and I'm really happy! Sunday night, as we arrived at the Blog Party, we were given party favors. Indeed! 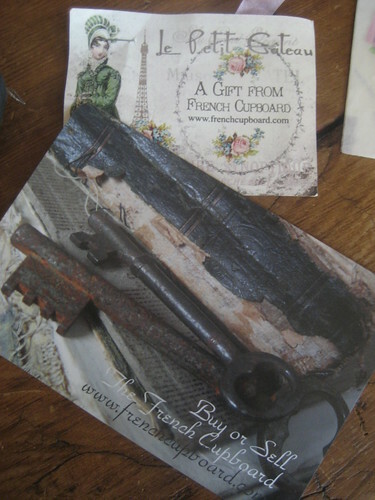 Polly with Counting Your Blessings and The French Cupboard put together some treasures for our pleasures! Here is that lavender that I mentioned. 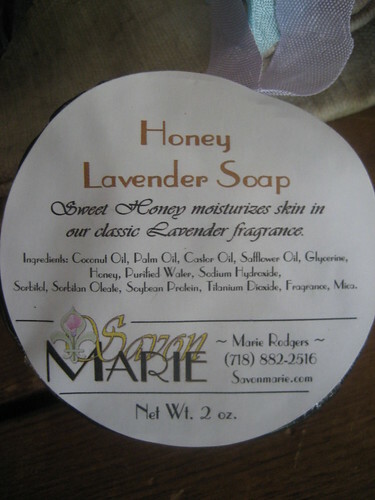 A honey lavender soap. Yummy! 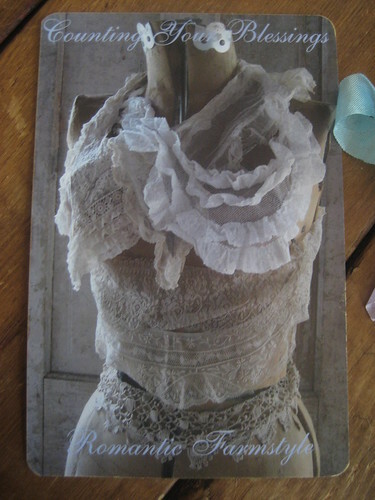 This was contributed by Marie at Savon Marie. 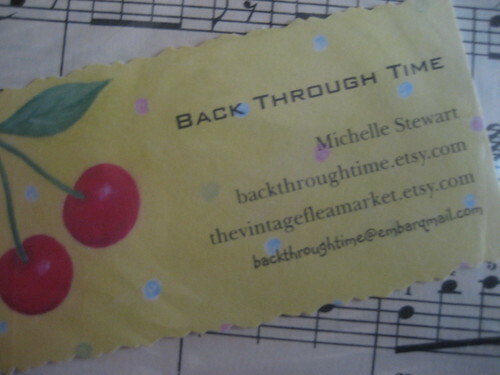 And here is a wonderful collection of ephemera donated by Michelle at Back Through Time. 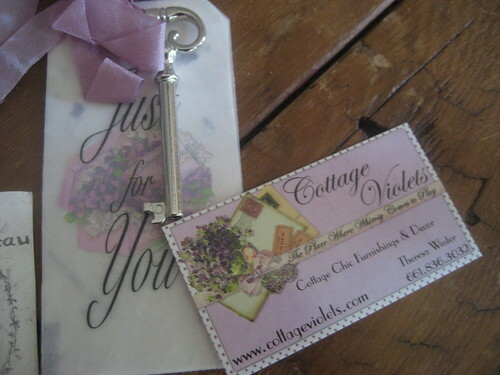 And then, there is this darling gift card or bookmark or potential necklace embellishment donated by Theresa at Cottage Violets. While I don't have a picture to share, I did see one of Jill of Gypsy Brocante's wonderful flowers floating around in Robelyn's goodie bag. Thanks Jill! Sorry I didn't nab a picture! Be sure to check out these great vendors. I've spent a little time perusing their sites and I'm liking what I am seeing. Thanks everyone! And a big thanks to Polly for thinking of us. We missed you at the show and party! Fun and laughter and goodies...oh my! 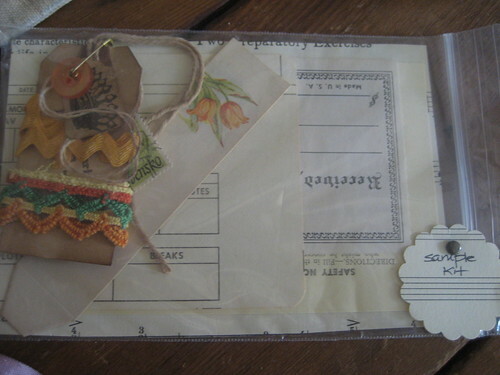 I took pics of my goodie bag the other day, I still need to post them. And yep, I was one of the lucky gals that received one of Jill's gorgeous rosettes. Aren't bloggers the most generous folks? I think so. You're wonderful! Thank you for posting some pictures. Our French Cupboard gals will be so delighted. I think we need to put a goody bag together for Malisa... whatcha' think? We could all get together and take it to her. Just for her.